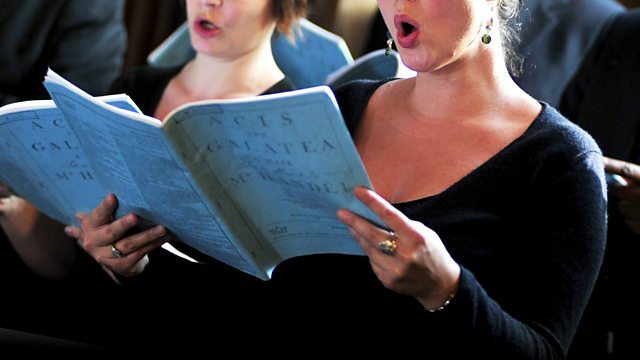 Sara Mohr-Pietsch discusses choral holidays, talks to singer and vocal coach Linda Hirst about her life in choral music, and introduces Vaughan Williams's Serenade to Music as her Choral Classic. Plus amateur chorister, Ali Masters of Tilehurst Rock Choir invites listeners to 'Meet my Choir'. Choir: Accentus Chamber Choir. Music Arranger: Franck Krawczyk. Conductor: Laurence Equilbey. Conductor: Bernard Tétu. Performer: Noel Lee. Choir: Chamber Choir of the National Orchestra of Lyon. Performer: Chamber Choir of the National Orchestra of Lyon. Conductor: Bernard Tétu. Orchestra: English Chamber Orchestra. Conductor: Matthew Best. Singer: Amanda Roocroft. Singer: Anne Dawson. Singer: Linda Kitchen. Singer: Elizabeth Connell. Singer: Sarah Walker. Singer: Jean Rigby. Singer: Diana Montague. Singer: Catherine Wyn‐Rogers. Singer: John Mark Ainsley. Singer: Martyn Hill. Singer: Arthur Davies. Singer: Maldwyn Davies. Singer: Gwynne Howell. Singer: Thomas S. Allen. Singer: Alan Opie. Singer: John Connell. Ensemble: The Hilliard Ensemble. Director: Paul Hillier. Choir: Schola Cantorum of Oxford. Conductor: Mark Shepherd. Performer: Paul Jacobs. Choir: Women's Chorus of the Choral Art Society. Orchestra: New York Philharmonic. Performer: John Canarina. Conductor: Leonard Bernstein. Conductor: Andrew Parrott. Ensemble: Taverner Consort. Choir: Taverner Choir. Conductor: Henry Wood. Orchestra: BBC Symphony Orchestra.